Has anyone considered that the higher resolution map is more accurate? Looking at the lower resolution one it's kind of difficult to tell which color the island is supposed to be. Is could even be a trick of the eye since the way we perceive color is highly influenced by the neighboring color(s). That said, looking at it in Photoshop without any bicubic filtering to making it blurry it does look suspiciously yellow on the southern end and a bit browner in the northern end. Doing a Google image search gives me a number of different maps though I'm sure a number of them, including the ones already posted are interpretations as opposed to images coming directly from Bethesda. I'd say we should go with whatever seems to be the most common interpretation and/or the one which seems to come from the most reliable source. 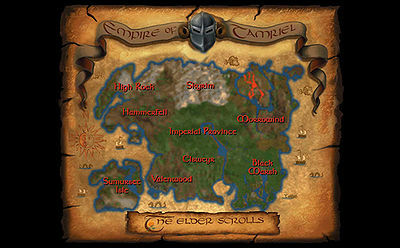 This map clearly shows the island being part of Black Marsh. The official in-game map from Arena shows the island but the borders aren't clear enough to be sure which region it's intended to be in. The character generation map from Daggerfall doesn't even have borders on it so that's kind of useless. There are a few other maps but most do appear to be fan-made. Unless I'm ill-informed the Imperial Library is kind of a reliable source (as I recall it was used by the author of the official Elder Scrolls novels) and at least two of the maps to be found on it show the island as part of Black Marsh. It wasn't included in Oblivion (neither was Stirk, but most every map of Tamriel shows Stirk as part of Cyrodiil). So personally I'd just as well say we shouldn't include it-it's extra work and we already have plenty of space to add our own unique ideas without this extra bit of land. Yeah, I like the map from the Imperial Library better. If, in the future, someone wants to make a Black Marsh mod compatible with this mod but wants to do the island as an Argonian island but we've already done it as an Imperial island. Best if you just leave the island for a Black Marsh project and work together on it than. That said, looking at it in Photoshop without any bicubic filtering to making it blurry it does look suspiciously yellow on the southern end and a bit browner in the northern end. This is what I think. Seems to blend from one color to the other. Well, if land from Leyawiin was just recently forfeited over to the empire, it lends to the belief that Cyrodiil wouldnt expand much more south than leyawiin to that time. With the proximity to Argonia, I really feel like it only makes sense as a "solstheim" type area, where its owned by Argonia but it has imperial bases. Not too mention, with its close proximity to Argonia it'd be more likely to need a few different models than blackwood. Indeed, I would only push it at the end if we want to roll into Argonia, which may or may not already be begun again by someone at that time in the future. Still something to keep in the back of our minds as we move forward. Why not make it as a small release like Stirk. 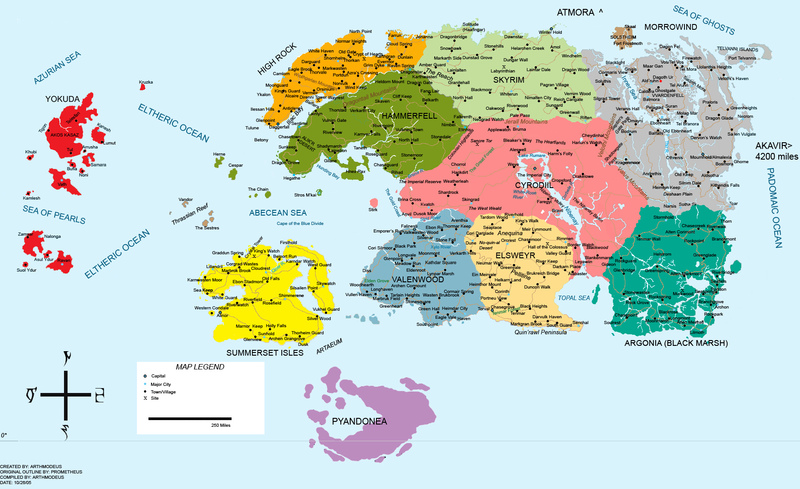 There are no big cities and the Island can be Cyrodiil in the south and Argonia (Black Marsh) in the north). I have found no lore about this Island and no name i.e. no strings. Maybe couple of villages and a few quests pref. with some politics. the "only" problem would be how to get there and incorporating the map. Am I wrong in thinking this could be done faster than say Stirk ( I am no good at the actual programming and modding). It would be a good way to get out a mod and have more people-modders aware of this site. BTW if you need writers(inventing plots) or proofreaders let me know I would be happy to help and I do spin a good yarn. I am Danish, but I have worked as an English teacher so my English should be up to par.